April Availability! 3 King Suites! Right on the River & On the Shuttle! Located on 125 River Park Drive; sprawling above a gorgeous section of the Blue River. 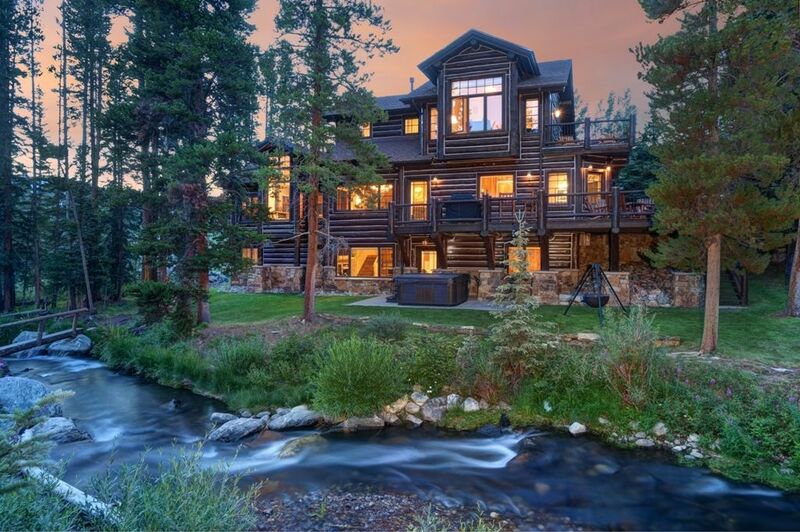 'The River House' boasts a superb location convenient to Downtown Breckenridge within 1/2 mile! This dynamic log home was built for the vacationer seeking the highest quality setting with a lavish interior. 3 stories of well designed space will attract you from the moment you walk in the door. • 4,080 total livable square feet. • 3 bedrooms - 3 1/2 bathrooms. • Panoramic views of Ten Mile. Ski Area & full river frontage. • Custom handcrafted log railing. • Large timber framed ceiling. • Slab granite counter tops. 6 with incredible river view. • Breakfast nook with TV area. Downhill Skiing, Cross Country Skiing, Hiking, Sledding, Biking, Fishing, Hunting, Wildlife Viewing, Horseback Riding, Golf, Tennis, Shopping, Boating, volleyball, Ballooning, Frisbee Golf, Sleigh Rides, Snowshoeing, Ice skating, Carriage rides, Snowboarding, Fly-fishing, Kayaking, Snowmobiling, Dining, Outlet shopping, Mine Tours, 4 wheel Drive Tours, Historical tours and museums, Horseback riding and Wagon Rides, Ice skating, In-line skating, Performing Arts, Pottery studios, Vintage train rides, Dog Sledding, Fishing, Sight-seeing, Historic Walking Tours, Mining Tours, Swimming, The Alpine Slide, Peak 8 Fun Park, Music Festivals, Golfing, basketball, bowling, bird watching, boating, Day Spas, Cycling, Live Theater, Pilates, Recreational Center, Restaurants, Sightseeing, Yoga,..... and more! Easy day trips to: Vail, Beaver Creek, Glenwood Springs, Aspen, Copper Mountain, Keystone, Denver. Breckenridge Ski Area and Resort, Real Estate, Reservations. Jane Hamilton and Tom Riggins with JanesLodges: Property Managers for the Singerman's "River House". Gorgeous River location and a magnificent Log Home are the perfect ingredients for The Singerman's Home away from Florida. BEST River frontage in Breckenridge. Uniquely close to downtown Breckenridge! Right on the Blue River! We had a wonderful winter vacation. We'll be sure to return in the Summer. We were very happy. The host recived us with a warm soup, it was so thoughtful. The house was beautiful and very well equipped. The porpuse of our trip, was to spend time with our kids, and definitely, the house enabled us to do that. Beautiful property!! Moose outside in the morning was a bonus!! Perfect for a family gathering any time of year! Beautiful house which is immaculately maintained in a location just outside od town. Easy access to ski lifts, dining, and shopping. Kitchen has everything you need to cook all of your meals and never leave the beautiful surroundings. The River House is an incredibly stunning home in a gorgeous setting. It's right on the river, with a swing on the bank of the river where you can sit and relax and enjoy the river, even in the winter.. There were 8 of us there for 1 week and we couldn't have been more comfortable. We really enjoyed cooking at home, as well as eating out at local restaurants such as Hearthstone, Empire Burger, etc. We skied several days, but also worked out at the Rec. Center, walked around town, and just hung out at home reading and relaxing. We also enjoyed getting a massage at home from a local massage therapist named Niamh (Breckenridge Bliss Massage). The property manager was terrific and and even had hot soup and bread waiting for us upon our arrival. We look forward to coming back again and can't recommend the River House highly enough to anyone going to Breckenridge! The River House is perfect. We couldn't ask for anything more and the pictures don't do it justice. It's nicer than it looks. The welcome put it over the top! Jane prepared hot soup with fresh bread for our arrival. Not to mention the wine and chocolates as well! The Minimum Age requirement to rent this property is 30. Guest renting, must also be staying at the property. WE DO NOT Rent this Property to College Groups; or College age groups. There is a Minimum Stay Requirement on all of our Properties. Sometimes however, if a GAP is available; We will honor less than the Minimum Night’s Requirement. Please inquire. Maximum Occupancy: 6 (including children) A Refundable Security Deposit of $2300 is due when a Reservation is made. Damage/Security Deposit is fully Refundable. A Security Sheet will be included in your Confirmation Package from JanesLodges. Sorry, No Pets here. If traveling with your pet; Please check listing #78697 No Smoking; Strictly enforced! You will receive a Liability Agreement and Security Deposit Agreement from JanesLodges once you reserve this home. These items will need to be signed and returned to our office.